THE labor of preparing and bringing out a new Gazetteer of the United States has become great and difficult. A considerable number of years have elapsed since any work of this kind has been given to the public as the fruit of original research. These have embraced a period of extraordinary progress and development in the whole economy of the country; during which our new settlements have been multiplied and extended with unexampled rapidity, and most of the districts, towns, and cities of an earlier date have made advances in population, wealth, and internal improvements, which have given to some of the older states a character and an aspect almost entirely new. Numerous nourishing places at the west, now the marts of an extensive trade, and seats of civil jurisdiction, have sprung up within that period; while great numbers of our maritime ports, and manufacturing towns and cities, in the Atlantic States, have seen their population, and every element of their prosperity, wonderfully augmented. Hence the necessity of going over the whole ground, as far as possible, with new and careful investigation; questioning and doubting the old authorities at every step, and obtaining accurate information from the most recent and authentic sources. In the endeavor to accomplish this, the author has spared no labor nor expense which it was in his power to command. Having devoted himself almost exclusively to the pursuit of information in this department for many years, during which time his Gazetteers of New England, and of the states of Massachusetts, New Hampshire, and Vermont, have been given to the public, and having, for this purpose, travelled somewhat extensively, and made himself personally familiar with the physical and social characteristics of the country, he has endeavored to pass an intelligent judgment upon the genuineness and accuracy of all the materials incorporated in the work. Yet perfect accuracy, in a work of this extent, is unattainable by any human diligence; and the author claims, on this score, nothing further than to have employed his best exertions, under some peculiar advantages, for the successful accomplishment of his object. The most competent and able assistance has been freely employed, in the preparation and revision of the materials embodied in the work. Many of the papers on particular subjects, such as those on the higher educational institutions, the banks, the currency, the population, &c., have been prepared by gentlemen distinguished for their acquaintance with the several departments of learning to which they pertain; and a large number of the roost elaborate articles in the descriptive portions of the work were written by persons familiar with the places and the scenes described. To these, and to other individuals, who have been steadily employed upon the undertaking, for a longer or shorter time, the author is happy to acknowledge himself indebted for a large amount of what is valuable in the subject matter, and much that is attractive in the literary execution of the work. He would specially acknowledge his obligations to the public officers of the several states and of the United States, to whom he has been indebted for many valuable documents; to the Rev. WILLIAM JENKS, D. D., for his articles on the New England States; to JESSE CIIICKERING, M. D., for his assistance in the population tables; to CALEB STETSON, Esq., for his valuable article on banks; and especially to the Rev. SAMUEL II. RIDDEL. late secretary of the American Education Society, for his assistance in the preparation of the entire work. The standard authorities which have been consulted are, the general and local gazetteers of former dates, numerous county and town histories, that valuable series of volumes known as Historical Collections of several of the states, the American Almanac, congressional and state documents, reports of corporations, topical and coast surveys, journals of the most intelligent tourists, guide books, maps, and other works, geographical, geological, and statistical, from which appropriate information could be derived. The substance .of all which may be considered as of real value, in reference to the legitimate purpose of a gazetteer of the country, has been made to contribute to the completeness of the present work; to the exclusion, however, of a large class of unimportant details, with which the pages of works of this kind have frequently been encumbered. Statistics which are comparatively trifling and unessential in themselves, or such as must cease to be of any value after the changes of one or two years, have been usually omitted ; and the space they would have occupied has been redeemed for matter of more general interest, and for such material facts as are wanted to satisfy the intelligent inquiries of persons interested in obtaining a knowledge of any portion of the country, for ends important to themselves. The interest and convenience of the reader have also been consulted, in regard to the facility of such casual references as a work of this kind is chiefly intended to supply, by breaking up the mass of its materials into several distinct sections, as indicated by a natural principle of distribution and arrangement. 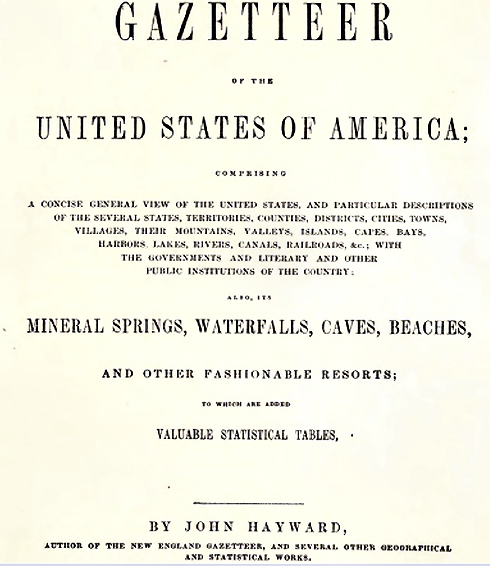 The general descriptions of the states and territories; the grand physical features of the country; the great body of its inhabited places, whether denominated cities, boroughs, towns, or villages; its chief localities of fashionable resort, and of curious interest to the traveller; the smaller post villages, which are only of consequence as such ; the population, colleges, banks, and various statistical tables, are severally placed by themselves, under distinct and appropriate titles, instead of being all embodied, as has been more commonly the case, in one promiscuous and indistinguishable series. Thus the person consulting this Gazetteer will be saved much of the perplexity and hinderance of running his eye over pages of a long and crowded alphabet, to find the subject of his inquiry; while, at the same time, important portions of the work are thus presented, in a much more interesting and instructive form, to the general reader. The failure of Congress, hitherto, to provide for the publication of the seventh national census, has necessarily occasioned a postponement in the issuing of this work, from the time contemplated in the original prospectus, and has required a laborious and expensive resort to other methods of obtaining the information which that public document was expected to supply. This delay, however, has been diligently improved in more carefully elaborating and perfecting important portions of the work, and in bringing the whole down to a much later date than was at first intended. In all the toil of this arduous and protracted undertaking, the author has been much sustained and animated by the hope of offering an acceptable and useful service to his countrymen, and of contributing, in no small degree, to illustrate the prosperity and glory of a people, whose advancement, in all the elements of a free, Christian civilization, is becoming, more and more, the admiration of the world. In the confidence that neither of these good ends will be entirely lost, the labor of years is now submitted to a liberal and enlightened public, to meet with such approval only as its merits may deserve.